If you do not have a whole lot of space, or you just want to try something different, you can try straw bale gardening. Straw bales are great for people who want to grow a garden, but lack the space, or they have uneven yards or hills. Another great reason to use straw bale gardening is to create a raised bed for your plants. If you find it hard to get on the ground, you will find it much easier with raised beds. Another added benefit to straw bale gardening is that you will not have to weed your garden. And for more innovative ideas, go to gardeninginfo-online.com. You will need to first figure out how many straw bales you will need. You can use straw bales or hay bales for this project. Check your local garden supply store and farmers in your area to see what they have. Chances are you can probably find straw bales for free or really cheap. Once you have your straw bales you will need to take the time to plan where you are going to sit your bales. Bales will get very heavy with the plants and water, especially after it rains. This will make them impossible to move. So make sure where you put your bale is where it will stay. Make sure that you leave enough space between your bales to walk through as well as mow if needed. Remember to put your bales out in full sun or whatever the plant your are planting requires. You can plant anything that you want in a straw bale. If you want cucumbers, you will have no trouble growing cucumbers. Other things that you can grow in a straw bale include lettuce, cabbage, tomatoes, squash and zucchinis. If you are growing tomatoes in your straw bale, make sure that you stake your tomatoes. If you do not stake them up, eventually they will start to tilt and you may have damage to your plant. You will need to prepare your bales before planting. 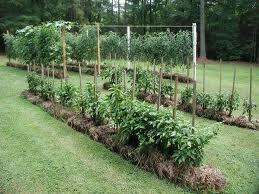 For at least 2 to 3 weeks before planting they will need to be kept damp and have fertilizer added to them. If you do not want to use store bought fertilizer, you can use all natural fertilizer. Fertilizer for at least 3 days and continue to keep the bales damp. Before planting make sure that you stick your hand into the bale. If the heat has cooled, your straw bale is now ready for planting. You can choose to plant from transplants or seeds. If you are starting from seed you will need to put in a couple of inches of seed starting mix and water the seeds. If you are starting from transplants all you need to do is make a crack in the bale and place your transplant there. You can add some potting mix to ensure the plant has adequate nutrition. Do not let your bales dry out. Make sure that you water frequently but check each time before you water. As the bales begin to decompose they will need less water as they hold moisture in. Straw bale gardening is a great way to garden if you have a small space or simply do not have the time to till up larger areas of ground. It is also great for those with bad backs and other health problems. You can grow just about anything you want and a single straw bale can be used to grow several different plants. Many people say that they get the optimal amount of vegetables and fruit from growing on straw bales. Consider gardening with straw bales today!